This should probably be over in the Tidbits section, but…a real-time clock featuring Japanese girls doing synchronized dance movements to a jazz riff on Lerner & Loewe? Come on! 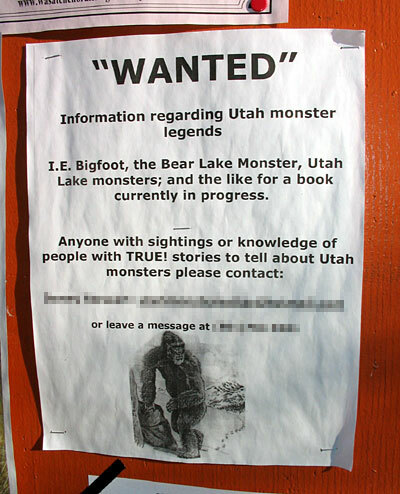 How insanely cool is that? I think they’re selling polo shirts, but, as I always say, do you really need an excuse for Japanese girls doing synchronized dance movements to a jazz riff on Lerner & Loewe? P.T. Barnum once sent an agent to buy a white elephant, sight unseen, hoping to use it as a circus attraction. When it arrived in Bridgeport, Connecticut, it was covered with large pinkish splotches and was not white at all. The public was not impressed and Barnum had to keep his “white elephant” hidden from public view in a stable while he tried to decide how to recover some of the high cost. The elephant later died when his stable burned down. As you might guess from something like the Tiny Pineapple Nurse Book Collection, my family excels at White Elephant gift exchanges. All through the year, we hoard the obscure, the bizarre, and the grotesque, waiting for the perfect opportunity to unload the atrocities on unsuspecting friends and family members. And if our first White Elephant party of the year is any indication, this year’s haul could be one of the best/worst ever. 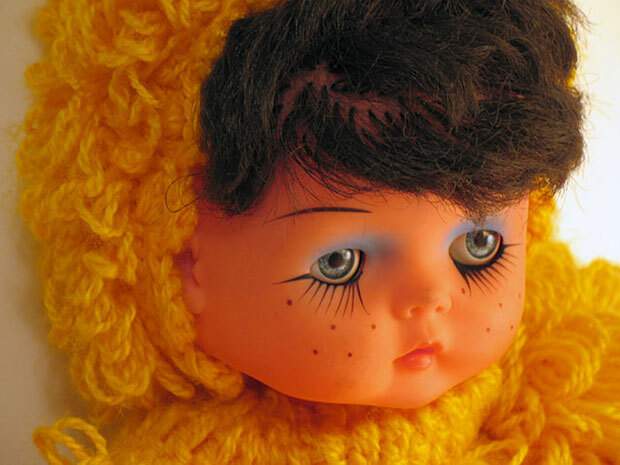 I had this cherubic spawn of craft-hell sitting in my room for a few days, but even though I’ve returned it to its rightful owner, if I wake up in the middle of the night, I can still see its ghostly specter sitting on my dresser, feeding on my soul. His tender tears set in wax. Light the wick and weep. 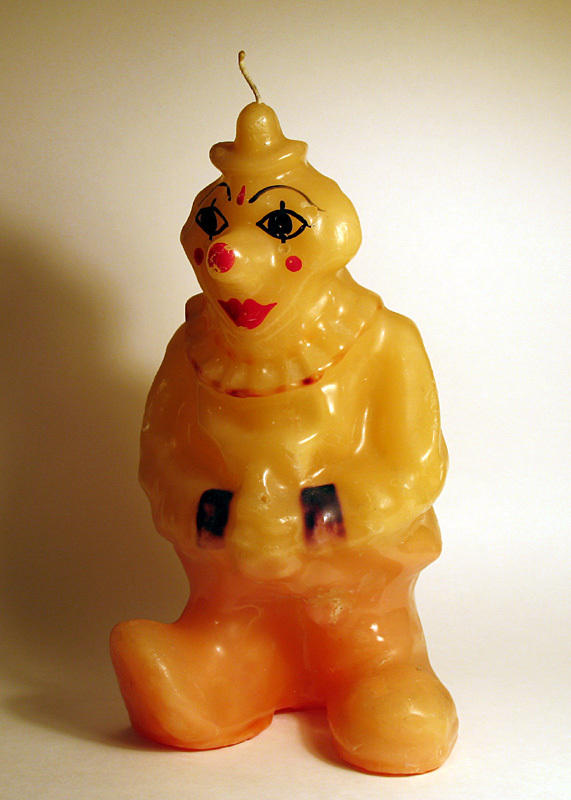 I’m sure this candle was a rich pearlescent white when it left the craftsman’s workbench, but the passing decades have given this waxy homage to “Le Clown Triste” the same yellowish hue as rancid tripe. Every time I even look at the thing I feel like I need to wash my hands. 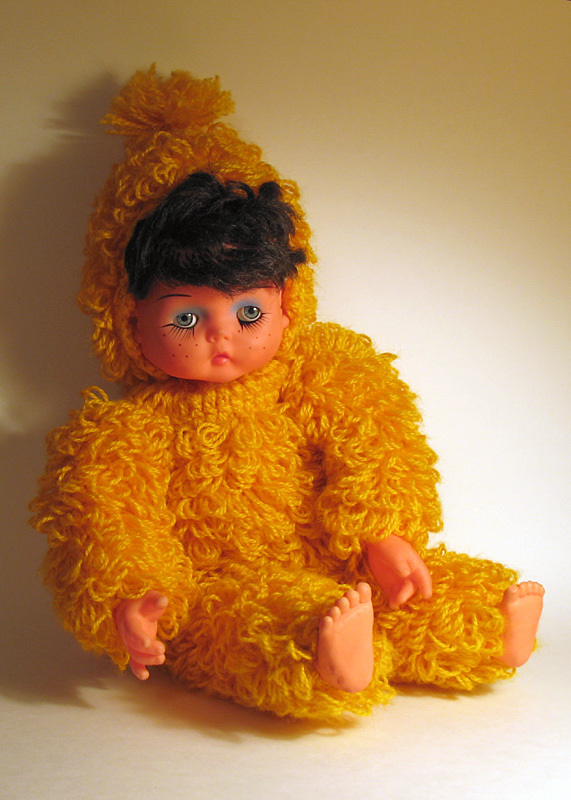 Wendy can be thankful that I didn’t end up with this beauty, otherwise it would be on its way to Kauai right now. 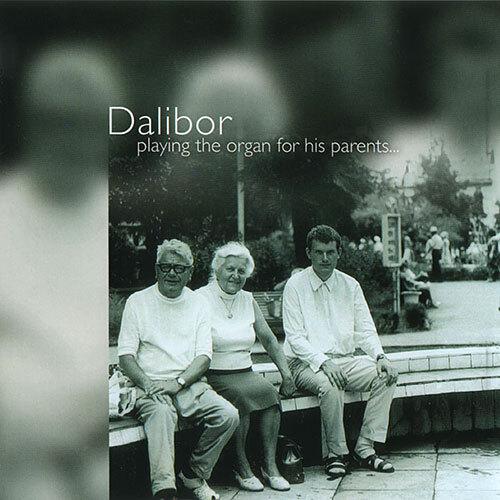 This music CD was presented to my sister-in-law, Pam, by her Czech gynecologist, Dr. Dalibor Hrádek. It features an original four-part composition recorded at St. John the Baptist Church in Glandorf, Ohio on January 21, 2001. Unfortunately, I’ve been conditioned to associate this style of organ music with silent films, leaving me with the impression that mornings around the Hrádek breakfast table must have been like something out of Murnau’s Nosferatu . 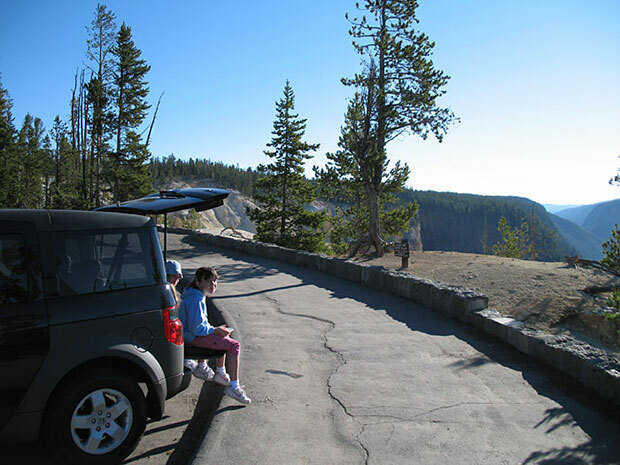 Watson, our Honda Element, is the consummate road trip vehicle. It is rock-solid reliable, it has plenty of room for suitcases and backpacks, the stadium seating gives kids in the back a decent view of the road ahead (decreasing the incidence of motion sickness), 39.1 inches of rear-seat legroom give the passengers plenty of room to spread their stuff out, and when we get home, the stain-resistant seat fabric and urethane-coated utility floor make it a breeze to clean up. 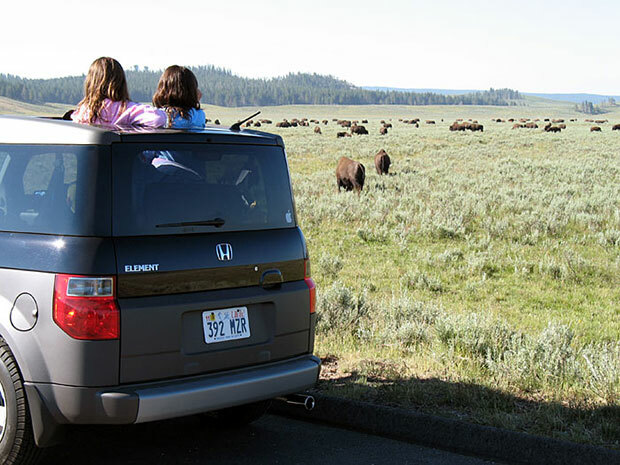 But there were two features of the Honda Element that we really came to appreciate while “on safari” in Yellowstone this year. 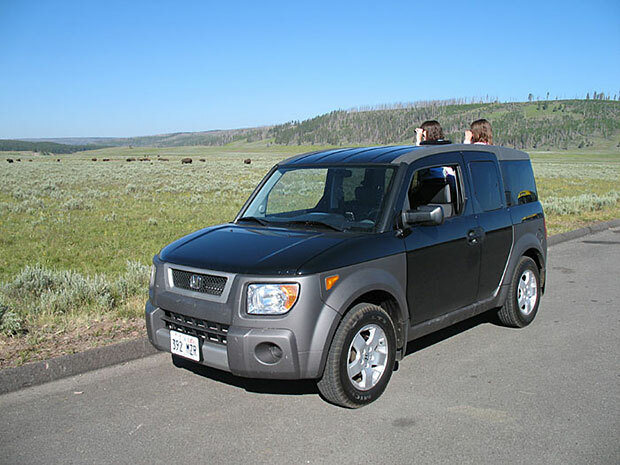 The Honda Element has a “tailgate,” an automotive artifact usually only found on pickup trucks or certain motorized vehicles from the mid-twentieth century called “station wagons.” So named because it is located on the “tail” of the car and sometimes opens like a “gate,” many people see the tailgate as merely a cargo access and containment device. 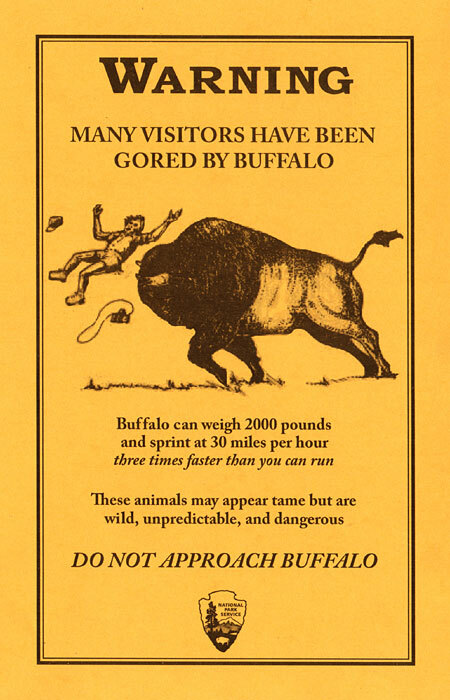 One of the difficulties you encounter while on safari is trying to view dangerous wildlife up close without meeting the same fate as the hapless photographer on the Yellowstone “Do Not Approach Buffalo” flyers. Well, with the Honda Element this is no problem at all. Simply pop out the removable sunroof and you are Serengeti-ready. Whenever wildlife makes an appearance, passengers in the back seat can unbuckle their safety belts (after the vehicle has come to a complete stop, of course), stand up on the rear seat, and while resting their bums on the rear headrests, survey the savannah with comfort and ease. And it doesn’t matter what side of the vehicle the point of interest is on since everyone has a 360° view of the veldt. 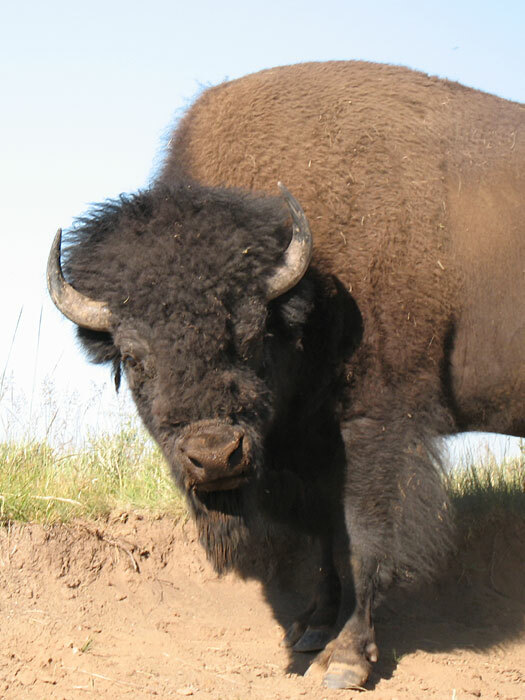 If an especially photogenic specimen appears, the driver can simply hand his (or her) digital camera to someone on the wildlife observation deck for a bisons-eye view of the roadside attraction. These are two very compelling features that Honda should be touting. Yet nowhere in the product literature is there a mention of either the “breakfast nook” or the “wildlife observation deck.” Sure, they list a “tailgate” and a “removable sunroof,” but perhaps it’s time for the Honda marketing department to start thinking outside the boxy car. This Nickel Could Save a Child’s Life! Then why are they sending it to me?